Wallflower is not easily confused with other wild plants on this web site. Familiar plant from parks to gardens, the wild version is slightly smaller than its cultivated cousin. 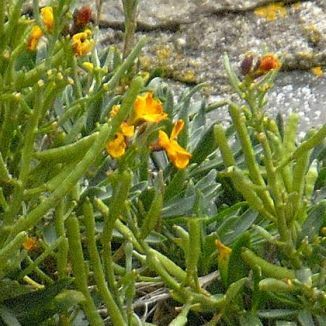 Usually found growing on old walls, dry limestone rocks and embankments, the fragrant, four-petalled flowers are usually yellow but can also be orange, dark red or brown. The flowers (25mm across) are on display from April to July and the seeds are in long flattened pods. This is a bushy plant which reaches to 60cm high and has narrow, pointed leaves. It is not considered to be a native as it is classed as a garden escape. It belongs to the family Brassicaceae. 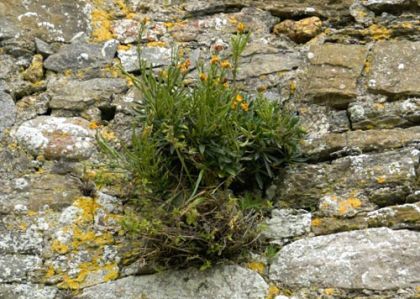 I first saw this as a wild plant growing on an old ruin in Fethard-on-Sea, Co Wexford in 2005 when I took the photographs. We're pretty mermaids and we shall not die. Except for ***, she's the only one. Then there was the other definition of a Wallflower which many girls going to the Saturday night 'hop' in the 1950's remember only too well!